Looks like being a great evening. A chance to meet the director, see the film, and of course eat some cake! 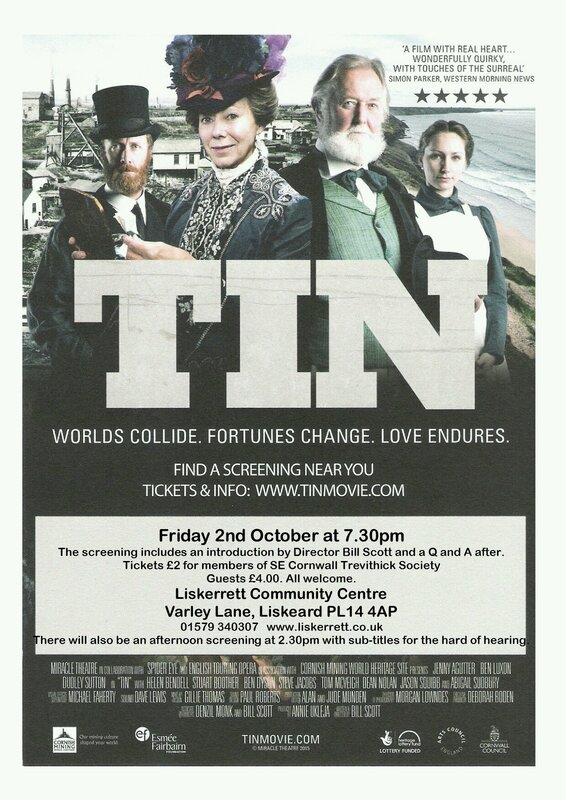 If you know anyone in the Liskeard area that may be interested- pass the word. The walk around Phoenix United with the Pensilva History Society was a great day. A day blessed with excellent weather and excellent company. 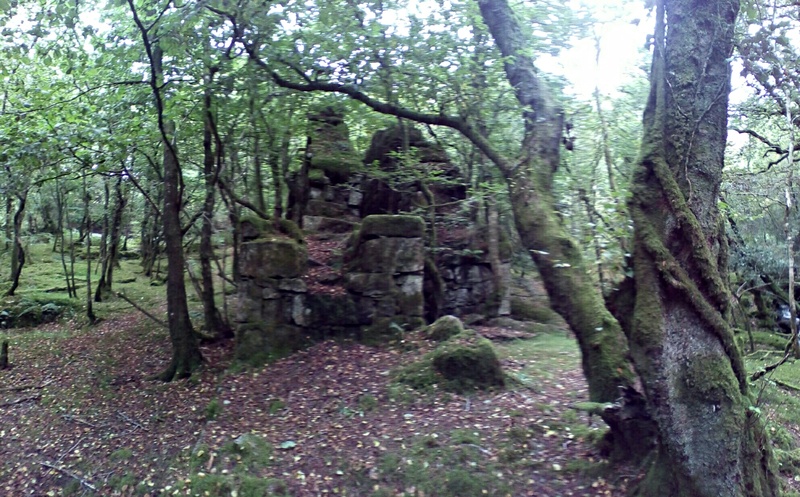 Despite the cotoneaster and bracken we found plenty of William West’s mine to explore. 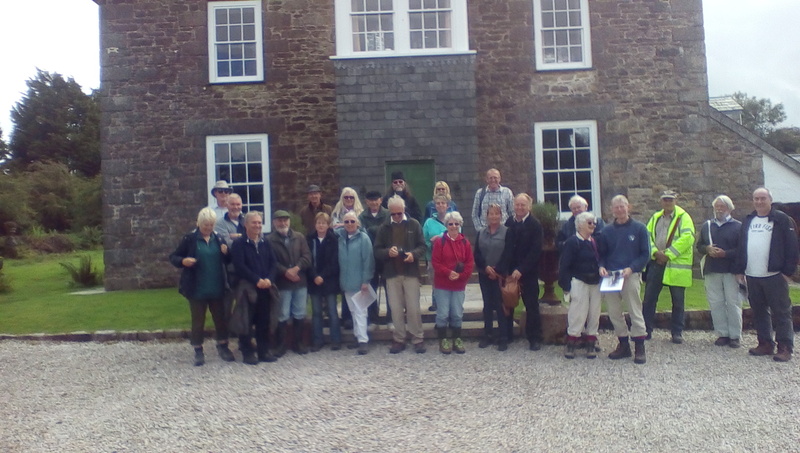 The had grown in my absence to becoming part of Mark Camp’s excellent South East Cornwall Walking festival- it was a bonus to be able to play our part in the week’s activities. I have listed all my the Phoenix United blog posts on a new page on this site, click here to view. The new page should provide a useful index for any one researching the mine. Now that the walk is over this blog will switch its focus to subject the next outings for my books. After perhaps a quick diversion into some random facts gathered in the background whilst Phoenix demanded its attention. One parting thought on Phoenix. 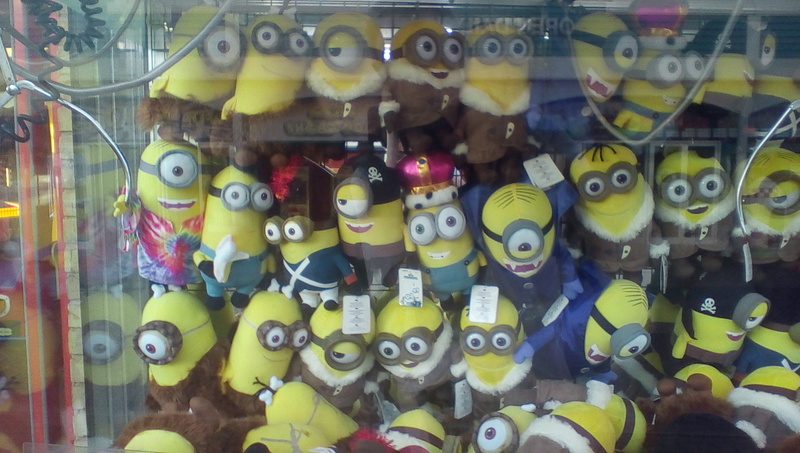 My final image of the site was visitors lined up at the Minion’s Village sign to grab ‘selfies’. Conclusion-Fictional Yellow gibbering beings now trump Heritage and landscape. Move aside Poldark! Phoenix United’s dressing floors were impressive. They spread out downhill in two directions from the stamp engines to cover the valley sides with in a complex array of tanks, buddles, leats and dressing machinery. This large industrial site was described in 1880 by the Mining Journal. “The situation of the Phoenix is admirably adapted for the laying out of tin floors, and full advantage has been taken of the position. Almost every available point on the northern slope of the hill down to Darley Ford is occupied with dressing apparatus, and the tin is followed from the shaft mouth down to very limits of the sett. There are three drawing shafts at Phoenix –Seccombe’s Sump, and West’s, and the three roads converge to one point on the dressing-floors. Both the shafts at West Phoenix are used for drawing, and as that mine is at a considerably higher elevation than the Phoenix, though the latter is on a hill, the stuff is sent down an incline to the West Phoenix floors, which lie a little to the west of Phoenix. The produce of each portion of the sett is kept apart, West Phoenix giving produce of 13 5/ 8 in 20, and Phoenix one of 13 ¼. The copper ores of which the mine is yet importantly productive, and of which in the south lodes it may be expected to be still wealthy, are, by the way, far above average quality. From the shafts the skips, which take an average load of 15 up to 17 cwts., are run direct to a Blake’s stone-breaker, which reduces the stuff for the stamps immediately below. Of these there are 96 heads on the Phoenix side, to which we are now confining our remarks, driven by a double 26-inch engine. We observe that the lifters of one half of the sett are of wood, and those of the other half iron; and on enquiry learn that the difference is due to experiment, but that as it has been found that wood is as good as iron for this purpose, and vice versa, each lifter as it wears out is replaced in the same way. These stamps were out by Mr. West in 1865, the first twelve heads of steam stamps having erected in the beginning of 1864, and the second dozen in July of the same year. It is a singular proof of how good men may be mistaken when dealing with matters that they do not fully understand, that the erection of even the first dozen stamps was opposed by Captain Uren, then agent, on the ground that there was not enough tin stuff in the mine to keep them going. Now, to keep up the regular returns, something like 100 tons of stuff has to be stamped a day. The stamped stuff is treated in the usual way, with buddles and frames. Of buddles there are upon this side 75, the great majority convex, and of frames 24. There are a couple of burning-houses of the ordinary type, and the water flowing thence is made to pass through a series of strips filled with scrap iron for the precipitation of the copper in solution which the calcinations releases. The craze is taken from the burning-houses to the pulverisers (of which there are three, capable of treating 10 or 12 tons a day), and after it is brought down, buddle and framed, and tossed and packed in the usual manner. The stamp heads weigh about 3 cwts. each, and with the lifters to 4 ½ to 4 ¾ cwts. The remainder of this description of Phoenix United Mine is reproduced within the paperback “The Last Great Cornish Engineer”. This is an extract from ” Webb and Geach- History and Progress of Mining in the Liskeard and Caradon District”, published in 1863. This Victorian book was written as a reference source for those considering investing in the mines of Southeast Cornwall. In addition to its description of Phoenix United Mine, the extract gives an example of the use of Victorian Cornish mining terminology. This is a rectangular piece of ground 760 fathoms in length by 500 in width, and is located in the south-western corner of the parish of Linkinghorne. The Western Boundary of the sett extends along the top of a ridge known as the Cheesewring. From the top of this hill, as far as the eye can reach, westward and north nothing is visible but bare conical hills, covered with short heath sloping on every side to marshy bottoms. Eastward the whole length of the sett is laid out like a map beneath the observer. The hill, falling at first precipitously to a deep narrow vale, rises sharply for a short distance, when the level and cultivated land is reached. It is on the summit of this small plateau that the buildings and works of the present Company are placed. speculators and they about 1836 formed themselves into a Company, under the title of the “Cornwall Great United“, which also comprised several other mines in the county. They held a lease of considerable extent of Duchy Land, which included the present Phoenix Mines, West Phoenix, South Phoenix and parts of North Phoenix and West Sharp Tor. 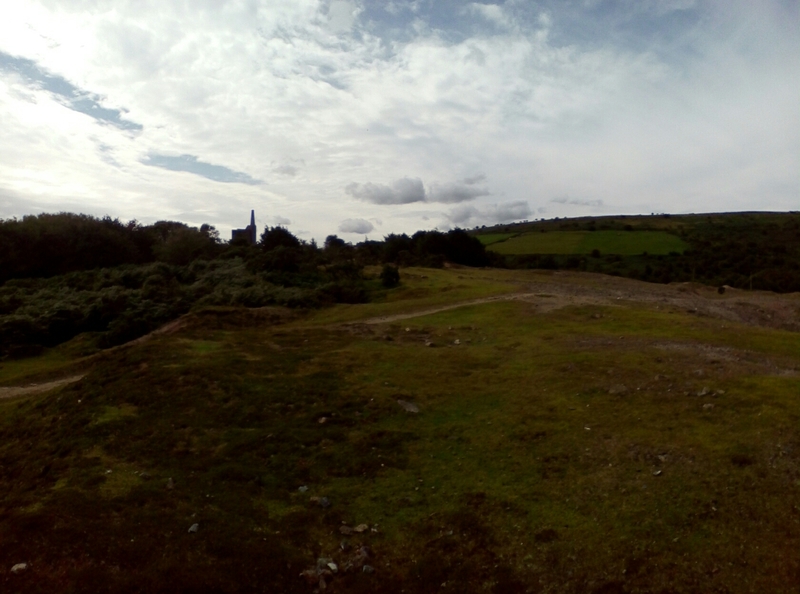 Under their management, these mines were named, Stow’s Mine, Clanacombe (present Phoenix Mines), Greenhill Mine, Wheal Prosper, and Wheal Jenkin. These last three having been noticed in South Phoenix paper, will not be again referred to here. A stamping engine was erected, which produced considerable quantities of low-priced tin ore raised from the Stow’s Mine. After working several years, without any good result, and having spent the whole of their paid up capital, amounting to upwards of £50,000, they were compelled to abandon the adventure. A portion of the adventurers, however, still un-dismayed, and seeking to retrieve a portion of their losses, obtained in December 1842 a renewal of the lease, nominally, for twenty-one years; but the lease was ante-dated about twelve months, thus practically reducing it to only twenty years’ duration. This lease reduced the sett to the limits before described. And the title of the Phoenix Mines was given to the Company. After a further outlay of £12,425, the mines became profitable in November 1852, since which time to December 1861 regular half-yearly dividends have been declared. After a steady perseverance and the large outlay of £62,425, the concern was brought into a paying state. There seemed now every probability that the shareholders would be reimbursed their original deficit. But at the end of 1858, the working became so deep and the water so fast, that, in order to carry the mine profitably, it was deemed necessary to erect additional and more powerful machinery, involving the expenditure of some thousands of pounds. The lease terminating in 1861, it was considered by the shareholders inexpedient to sink such a sum until they were assured by the Duchy of a renewal of the lease. It appears, however, that the Duchy and the Committee could not agree upon terms, and the lease was ultimately granted to some of the principle adventurers in South Phoenix, who have been in occupation for about eleven months. At the time when the Cornwall Great United first commenced their explorations, there was scarcely a mine in the neighbourhood; even the celebrated South Caradon was not as yet dreamt of, and it was indeed exceedingly against the reports of several able mining agents that the Company persevered. No one can refuse to admit that the working of the mine was the foundation of the great mineral discoveries which shortly resulted; and it is not exaggerating too say that £100,000 has been laid out on the Duchy Property in the immediate vicinity, entirely on the strength of Phoenix Mines, indeed mostly promoted by its adventurers. The lode in this sett is so different in every respect to those of the rest of the district south, as to merit a full description. In the village of Upton the back of the lode is seen in the road 300 fathoms west – the East Phoenix Company works it; still west 250 fms. 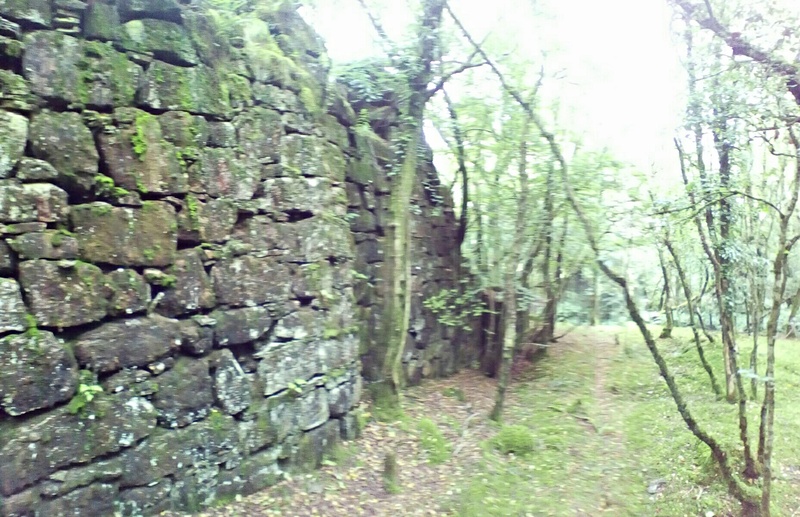 it is worked as Clanacombe Mine. The back of the lode to the west of this point has been so wrought upon by ancient and modern miners for a mile as to be seen at a considerable distance. After crossing the valley before alluded to, the course of the lode runs to the summit of the Cheesewring ridge, where it was first worked as Stow’s Mine; it then falls down the western slope to West Phoenix Mine, now abandoned. It will be seen, then, that there are four distinct mines working this remarkable lode. At the Stow’s Mine West, the lode contained towards the surface immense masses of highly ferruginous gossan, becoming, however, as it approached Clanacombe Mine, less impregnated with iron; gossan was here found in one place 200 fathoms deep, intermixed with grey ore. In depth the matrix is generally composed of large quantities of blue capel, carrying a leader of quartz and iron, in which the ore makes; a quantity of blue and green carbonate is also found. There is a little chlorite; butfluor-spar, found plentifully in most of the southern lodes, has never been seen here. A marked difference will thus be observed in this lode (as in that of Sharp Tor), compared to those of the Caradon, little more than a linear mile to the south. At Stow’s Mine large returns of tin were made by the Cornwall Great United above the adit. They drained the mine by a deep adit, taken up the foot of the hill, and driven westward 250 fathoms to Stow’s Shaft, with which it communicates 100 fathoms below surface. Under the late Capt. Samuel Seccombe‘s management, this shaft was sunk 45 fathoms below adit, and levels driven east and west, but the lode was found unproductive. The engine not being powerful enough to continue below the 45, and no promising indications justifying the erection of more powerful machinery, this portion of the mine was suspended. In Clanacombe Mine a rich course of ore was discovered at the 86. The principle bunches of ore were between the 120th and the 161st fathom levels; the ore holding down to the 216, which is at present the deepest level in the mine; 130 fathoms west of the old sump, in a deep valley streamed for tin, is a large cross-course – a continuation, in fact, of the West Caradon boundary cross-course, which there, as well as in South Phoenix, heaves the lodes to the left hand about 10 fathoms. This crosscourse is many fathoms wide, but has never been seen at the Phoenix Mines; as, although they have driven on a course of ore close to it, they were afraid to proceed, on account of the probable great influx of water that would ensue. The present workings are in granite, but a tongue of killas is deposited in the south-eastern portion of the sett, in which is a promising lode worked on the backs for a long distance, and called the Snuff-box Lode. To cut this lode, a cross-cut is being driven from the old sump south about 70 fathoms, and it is expected that in a short time it will be seen. The underlay shaft, on which a 60-inch engine is being erected, is about 80 fathoms east of the old sump, and is down to the 186. These mines have returned £105,000 in dividends. mine is divided into 200 shares, and employs about 250 persons. Pay-day, second Saturday in the month. 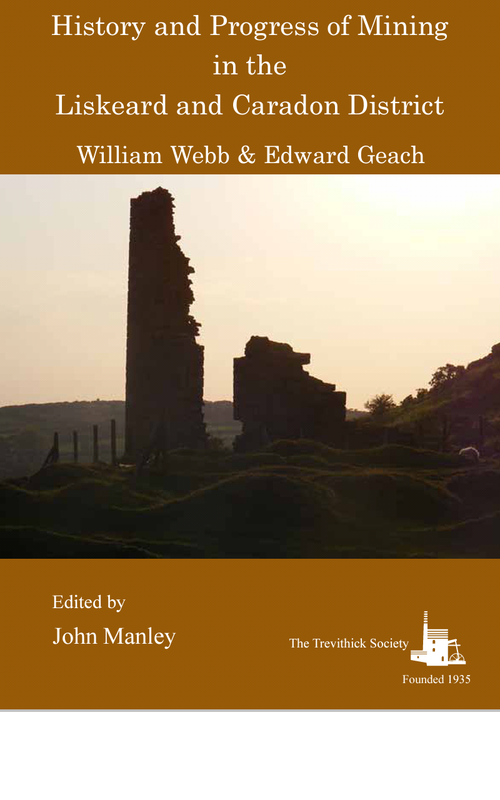 Although Webb and Geach gave an what appears to be an extensive account of the mine’s operations in 1863, they failed to mention William West’s buy-out of the Company, and his transformation of Phoenix United into a tin mine. A major omission that indicates how well William West hid his plan to take control of the mine. These extracts are from Brenton Symons’ 1863 Geological map of the Liskeard Mining District. Extracts complete with stains and cracks. 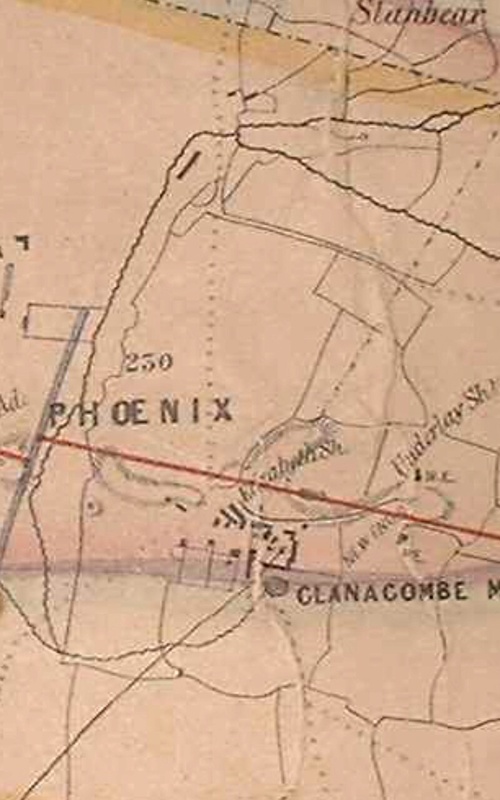 The first map shows the Phoenix United Sett, a square Sett (yellow tint=border) crossed by a single lode (lode=red Line). Running in a north easterly direction is the Great Cross-course ( cross course=grey line). The wavy grey shaded line represents the junction between the Bodmin Moor granite ( to the west) and Killas (metamorphised clay/slate). 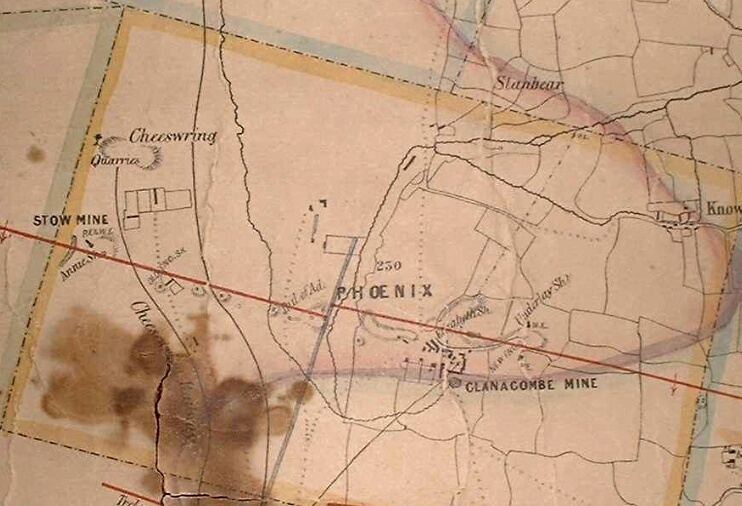 The second map is a close up of the Clanacombe Mine section of Phoenix United. It depicts the site prior to the massive changes implemented by WillIam West as part of his transformation of the mine from a copper to tin producer. The Phoenix tramway is shown running up from the southwest corner into the yard area. The extensive workings on the back of the lode are shown, and several shafts indicated. The ‘250’ denoted that the mine was 250 fathoms deep. A dotted line entering the extract from the northeast represents the course of flat-rods used to power the pump at Sump shaft from the large water wheel in the valley bottom. 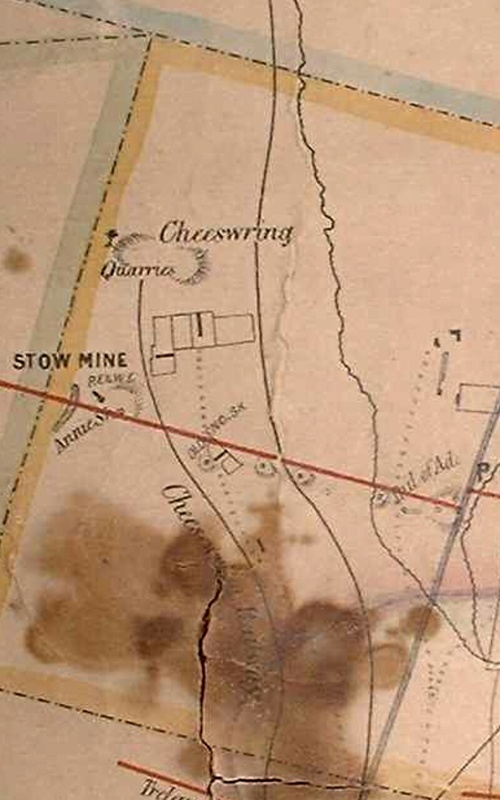 The final map shows the western part of the mine, which includes the old Stow(Stowes) mine. As the lode crosses the cross-course fault it is heaved to the south, a dislocation clearly shown. The Cheeswring granite Quarry is named near the western border of the set with a branch of the Liskeard and Caradon railway serving it from the south. For more extracts from this map see ‘The Liskeard Mining Area in 1863′.